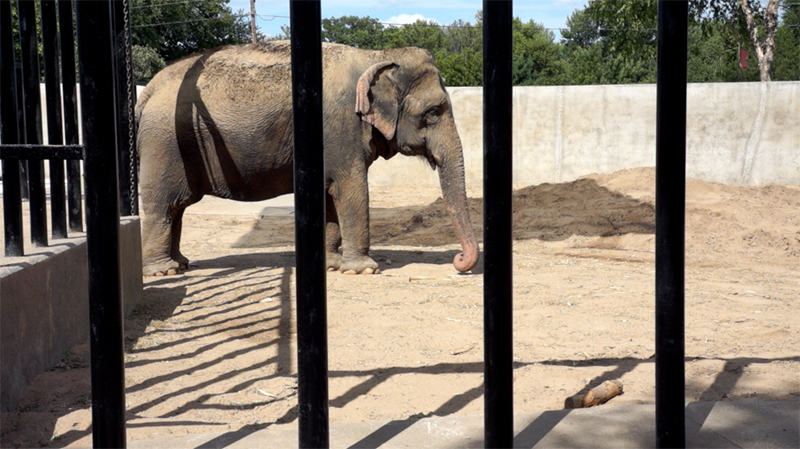 Only captive elephants exhibit weaving; it is an abnormal behavior defined as a stereotypy. 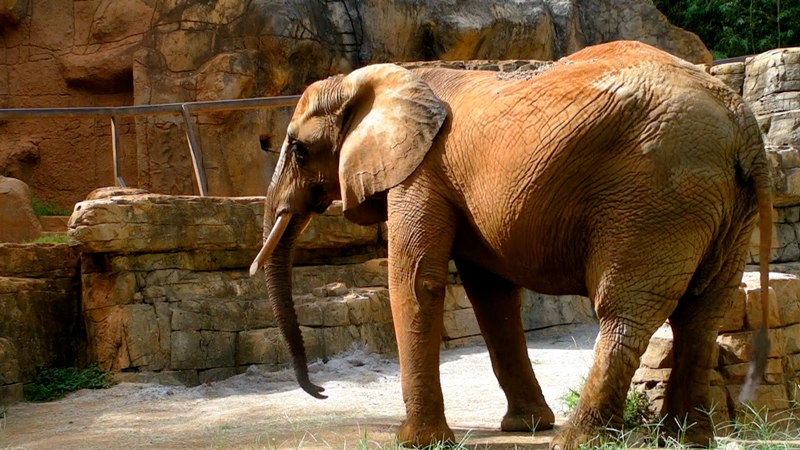 Rocking, swaying, swinging the trunk, head bobbing, stepping back and forth, or pacing are elephant stereotypies. This repetitive movement causes debilitating damage to the animals’ feet and joints. Stereotypies are a movement disorder found in humans as well. Ultimately, I envision the work being viewed in an installation consisting of simultaneously projected videos, combined with an audio installation of low frequency sounds. I am deeply curious about the human desire to witness (and thereby consume) nature. According to the Association of Zoos and Aquariums, over 175 million people visit zoos annually. This number exceeds visitors to ALL major league sporting events combined. Zoos are very complicated places. Is visiting a zoo a way of seeking connection with nature? Is it entertainment? What is so alluring about looking at animals? 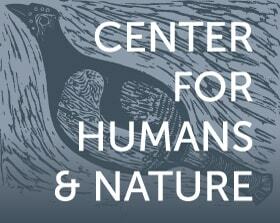 And further: In what ways do humans, as well as all living beings, seek soothing and connectivity? Many encounters with the “natural world” in our society today are steeped in contradiction or even absurdity. Though one focus of the project is thus an investigation of the notion of seeking nature, it also examines tensions between power and powerlessness, consciousness and unconsciousness, along with the inability to reconcile the pleasure of seeing a massive, magnificent animal with the reality of what is being viewed: distress. The video work I am doing stems directly from my long-term photography project titled Animals Are Outside Today. In 1928, Henry Beston stated regarding animals in his book, The Outermost House: “They are not brethren, they are not underlings; they are other nations, caught with ourselves in the net of life and time, fellow prisoners of the splendor and travail of the earth.” Animals Are Outside Today is a journey examining underneath that net, offering us the chance to contemplate our intersections with animals and consider the multi-layered impact humans have on other living beings. Contradictions define our relationships with animals. We love and admire them; we are entertained and fascinated by them; we take our children to watch and learn about them. Animals are embedded within the core of human history—evident in our stories, rituals and symbols. At the same time, we eat, wear and cage them with seeming indifference, consuming them, and their images, in countless ways. Our connection to animals today is often developed through assimilation and appropriation; we absorb them into our lives, yet we no longer know of their origin. Most people are cut off from the steps involved in their processing or acquisition, shielded from witnessing their death or decay. The series I presented in Animals Are Outside Today moves within these contradictions, always questioning if the notion of the sacred, and the primal connection to Nature that animals convey and inspire, will survive alongside our own evolution. Towards the end of photographing the Animals Are Outside Today project, I began what has become Warp of the Longitudes: Weaving. 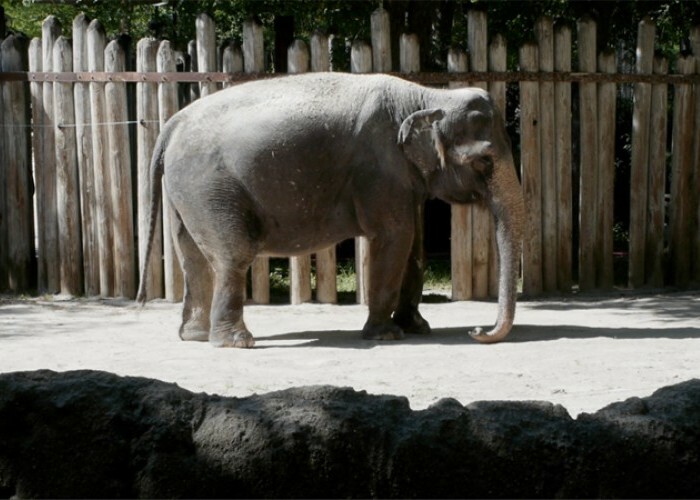 I was not exactly sure what I wanted to do when I began this specific investigation into captive elephants, but the project grew out of a road trip I decided to take with my daughters, Ruth and Elsa (then 7 and 3 years old). 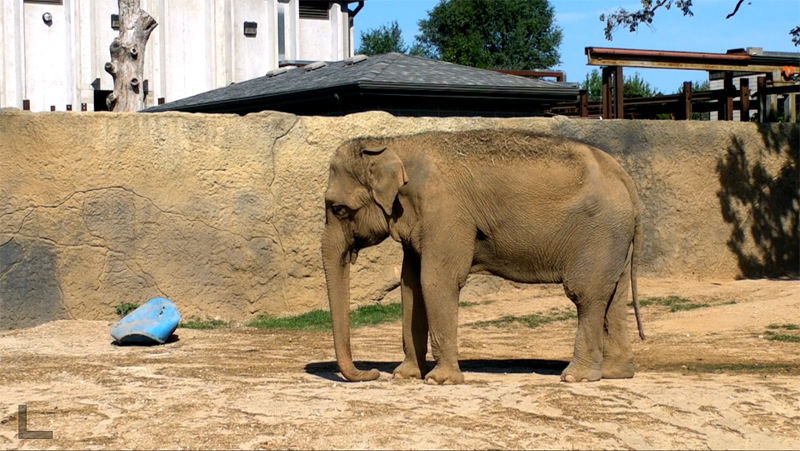 We set out to see the condition of elephants in all (or most) of the zoos between Chicago and South Carolina. Our route and timing were spontaneous; we camped and toured and had an adventure. We camped at Mammoth Cave and visited historic mansions in Kentucky. We drove through the Great Smokey Mountains, and camped near a magnificent, rocky, misty river. We visited the Biltmore Mansion and had lunch in what was (apparently) a legendary spot in Nashville. It was tiring (and at times grueling) to be on the road with two little kids, but it was mostly a fun summer trip. We stopped at zoos in Indianapolis, Louisville, Nashville, Knoxville, and Greenville, South Carolina. We also went to the front gate of “The Elephant Sanctuary” in Hohenwald, Tennessee. The sanctuary is not open to the public, but I felt it was important to at least see it from the outside and take in the vast space where the elephants lived and roamed (we did what we could with what we had to get a better vantage, even standing up on the roof of our Subaru). We drove alongside the long, long fence of the sanctuary to get a sense of the scale of the landscape available to the elephants inside. I made video at all of the zoos along the way but it wasn’t until nearly the end of our trip—after I kept seeing weaving elephants—that I knew what I wanted to do for the project. That first trip planted a seed that has grown deep and wide roots for the project. Since then, I have visited zoos in the Bronx and Syracuse with the girls, and set off on my own (the kids have not been coming with me on the trips anymore) to visit zoos throughout the Midwest: from Brookfield Zoo in Chicago to Coal Valley, Illinois (near the Iowa border). I’ve been from Toledo, Ohio, to Springfield, Missouri. I have made my way west to Salt Lake City, Albuquerque, and Oakland, as well as south to Miami. More trips are in the works; I am heading to Topeka, Wichita, Tulsa, Oklahoma City, Little Rock, and Memphis in two weeks. All photographs by Colleen Plumb.